President Trump claims "fake news" journalists aren't telling the real story in Puerto Rico, even though reporters are on the ground witnessing the devastation firsthand. 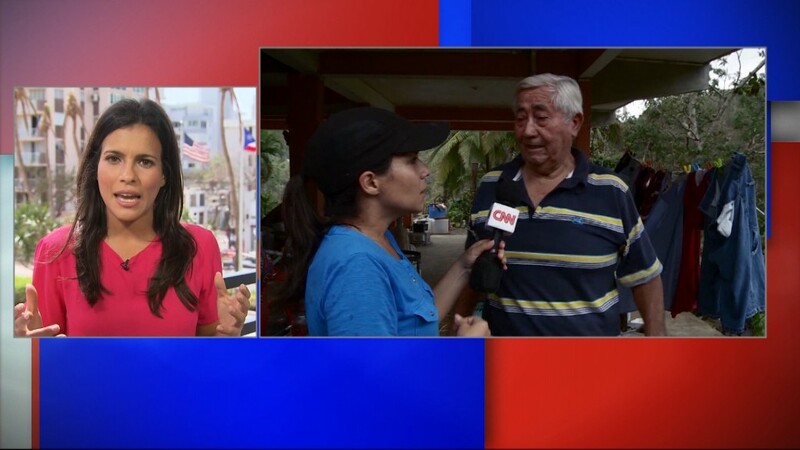 CNN's Leyla Santiago was born on the island and she has been reporting from there since Hurricane Maria made landfall nearly two weeks ago. She told Brian Stelter on Sunday's "Reliable Sources" that large swaths of land are still inaccessible. She said journalists often have found that they've arrived in some regions before first responders. In Santiago's hometown of Corozal, she said cancer patients sought refuge in a classroom. The room had been without power for six days because its generator stopped running. "They have no power, no medical attention, no food," she said. "Help is not arriving." The Trump administration's upbeat take on its response to Puerto Rico has not always matched the harrowing images and video coming from journalists stationed on the island. And questions are piling up about whether the administration's actions to address the crisis are sufficient. Trump has fired back against those criticisms. This weekend he attacked San Juan Mayor Carmen Yulín Cruz after she said Puerto Rico was "not a good news story." Cruz was responding to remarks made by acting Homeland Security Secretary Elaine Duke, who had earlier said she was "very satisfied" with the federal response and called it a "good news story." On Sunday, Trump doubled down. "We have done a great job with the almost impossible situation in Puerto Rico. Outside of the Fake News or politically motivated ingrates, people are now starting to recognize the amazing work that has been done by FEMA and our great Military," he tweeted. Trump also insisted that "all buildings" were inspected. That appeared to be news to Puerto Rican Governor Ricardo Rosselló, Santiago said. "He actually said that's not the case," she said. "He doesn't know of such inspections." To be sure, helping Puerto Rico is a massive undertaking. Nearly 89% of the island still doesn't have cell service, and debris has made some roadways impassible. FEMA said last week that about 10,000 federal workers are on the ground. And pictures of the military removing debris and loading trucks with water have made the rounds on social media. The Department of Defense said Saturday that 62 of Puerto Rico's 69 hospitals have been assessed, though only one is fully operational. It added that 55% are partially open and at least five are shut down. The lack of an ability to communicate on much of the island is a huge problem though, Santiago said. She added that many people on the mainland have been asking her to check on their family members in Puerto Rico. "It's been so difficult not only to reach people but also to reach government officials," she said. "How do you get an idea of what's happening on an island of three and a half million U.S. citizens when you can't reach all of the mayors? When you can't get to some of the towns?"